Yum-Yum however, is engaged to her guardian, Ko-Ko. Upon learning that Ko-Ko has been condemned to death for the crime of flirting, Nanki-Poo comes to Titipu to claim Yum-Yum's hand. After an odd turn of events, it turns out that Ko-Ko has not only been reprieved of his death sentence, but has earned a promotion to the post of Lord High Executioner. Nanki-Poo, not realizing that he's the son of The Mikado. He allows Nanki-Poo to marry Yum-Yum for one month, as long as he is executed after that month. 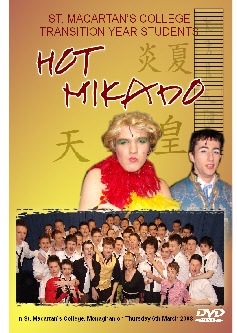 alive, and The Mikado has announced that he is coming to town that very next day!